Attendees at the first Native Women’s Business Summit, 2018. Photo by Jonathan Sims. As a Native American woman you often find yourself in spaces as the “only.” As in, the only Native American in a classroom, co-working space or even Zumba class. It is exhausting and lonely since so much of your time in these spaces is spent educating non-Native people about your culture. When I moved to New Mexico from Phoenix, I was making the jump from a career as a museum professional. 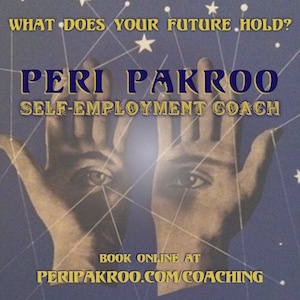 It was in this transition that I decided I was ready to launch my business, Grownup Navajo full-time. It is often said the journey of entrepreneurship is one of the most isolating. As I braced myself for this reality, I simultaneously began to connect with a local group of women who had created businesses and were eager to carve out more space for others like them. In the summer of 2017, a group of women began to discuss what it would mean to create an event for Native women in business. What resulted after months of discussion was the desire to build the first Native Women’s Business Summit. 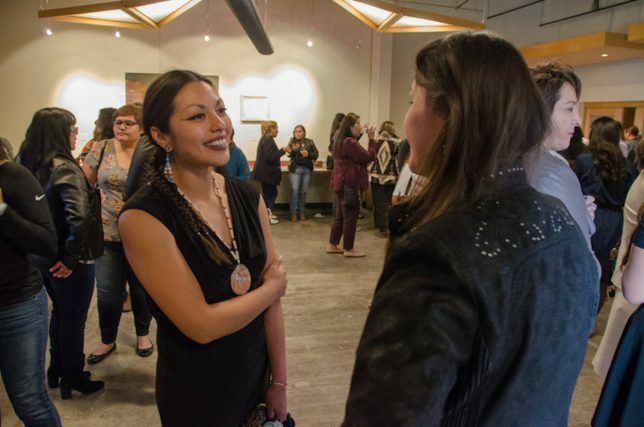 It was held in April 2018 at the Indian Pueblo Cultural Center and was a sold-out event. We had over 200 women at all levels of business join us for this inaugural meeting. We convened to learn, to be inspired and to build alongside each other. One of my favorite moments was during one of our movement breaks. We had scheduled Haley Laughter of Hozho Total Wellness to facilitate yoga for us throughout the day. There was this point where she guided us through a breathing exercise and you could feel the vibration from the collective breath of 200 Native women in sync. It was powerful! 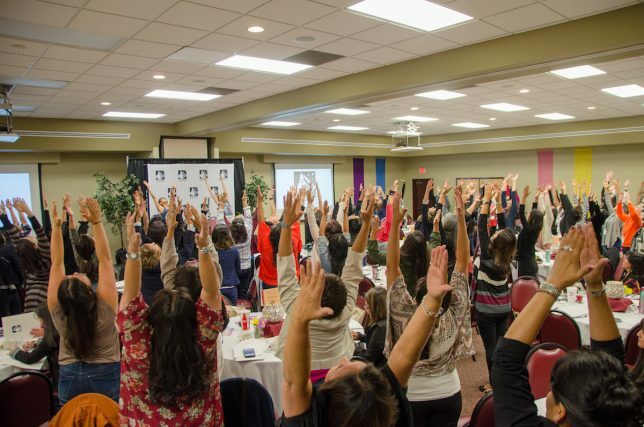 The power of 200 Native women breathing in sync. Photo by Jonathan Sims. This year, we are welcoming 300 Native women and have strategized to further our collective impact by choosing a cause to grow awareness around. We are designating $25 from the sale of each ticket to donate to the issue of missing and murdered Indigenous women and girls. It is important for us to model how we think society should engage in Native issues. There are many organizations who think Native engagement is solely offering land acknowledgements before their events. Native Women Lead wants to show that while there are many issues facing our communities, they can’t be solved without the insight and tenacity of Native women. Instead of waiting for invitations to task force meetings on these events, we have shown we are willing to not only build our own table, but rather build an entire summit to strategize solutions. 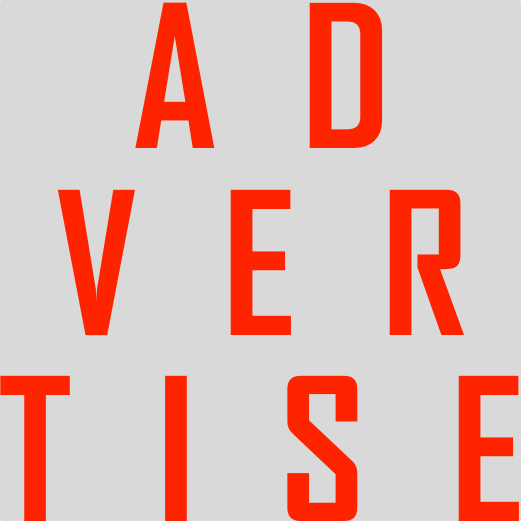 This year’s summit will be held April 5 and 6, 2019 at Isleta Resort and Casino. Click here for more information and tickets. To support the summit with a donation and help it grow, contribute to its GoFundMe campaign. 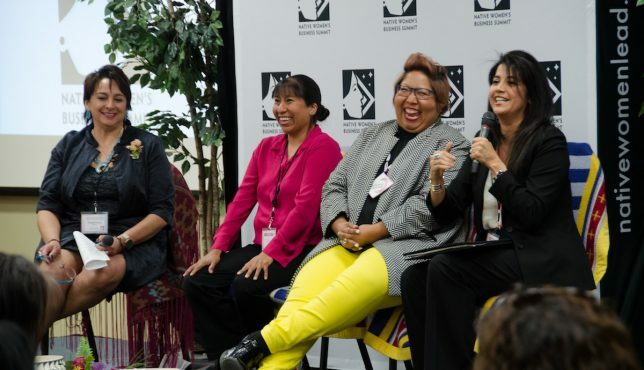 Panelists at the Native Women’s Business Summit, 2018. Photo by Jonathan Sims. Jaclyn Roessel was born and raised on the Navajo Nation. An alumnus from Arizona State University, she was the inaugural recipient of the Arizona Humanities Rising Star Award in 2013, which is given to young professionals whose work elevates the importance of humanities in the community. She’s been named one of Phoenix 100 Creatives You Should Know. Working in the museum field for over the past decade, and most recently as the Director of Decolonizing Initiatives at the San Diego Museum of Man, Roessel confirmed her belief in the power of utilizing cultural learning as a tool to engage and build stronger Native communities. She is the president of Grownup Navajo, a company dedicated to sharing how Native American teachings and values are tools to help build greater cultural competency in museums and other nonprofit organizations. Through all her work, Roessel aims to expand her work to further inspire Native people to use their traditional knowledge as a catalyst to create change in our communities today. Roessel lives with her husband and son in Santa Ana Pueblo. Profile photo by Hannah Manuelito.